The Olive Ridley Nesting season is here again and with it the usual worries that come with it. Already there have been over three dozen dead turtles washed up on the beaches between Thiruvanmiyur and Kovalam and every day there are more carcasses found. Hawksbill and Olivae Ridleys alike have been spotted across these neighbourhood beaches. Beach cleaning personnel have a tough task moving and burying these animals. They are often found dismembered and attracting crows. A dead turtle site can be spotted from afar due to the flock of crows and the fact that there is a distinct smell of a dead creature filling the air. Sifting through this and burying these turtles is quite a task in itself. There are many reasons people cite for these dead turtles. Turtles need to come to the surface to breathe every 45 minutes to an hour. Most trawlers do not use the turtle excluder device nets (TED) which allow turtles to make their way back into the sea. There is a ban on fishing trawlers within five nautical miles of the coast during this season along with the mandate on the types of nets these boats can use. Both these aspects need strict monitoring during this nesting season which lasts till March every year on our coasts. While a majority of the turtles are affected by the fishing boats the next most obvious reason is pollution. Plastic floating on the surface of water is easily ingested and can affect these creatures. To a hungry sea turtle — jellyfish, plastic bags or balloons, all look like food! Marine animals are at risk of becoming entangled and injured in this floating trash. Sometimes, the trash is ingested — leading to a variety of issues. Digestive tracts can be blocked, which can lead to starvation and death. Eighty per cent of plastic debris comes from land, according to the Sea Turtle Conservancy. It gets picked up by wind or washes out to sea from our beaches, streets and highways. Plastic debris includes plastic bags, balloons, bottles, straws, packaging and other material as well as displaced fishing gear. There are currently over 100 million tons of plastic estimated in the world’s oceans. In our city, trash from homes along the Buckingham Canal wash into the Adyar River and then finally out into the ocean. There is a lot of plastic that the sea spits out back onto our beaches. We first need to curb littering our inner city waterways to keep our oceans plastic free. The second aspect of course is waste and litter from the coastline beaches themselves. Very often along my local beach, I find garbage remnants from people celebrating on the beaches — cake foil cardboard, spoons and knives to balloons — I have seen it all! Remember that even when far from the sea, balloons and other plastic trash may end up harming marine life and affecting entire food chains that come back to impact our own lives. So, the next time stop and pick up your trash, whether you are in the city or on the beach. Your litter could be responsible for killing a turtle in our oceans. 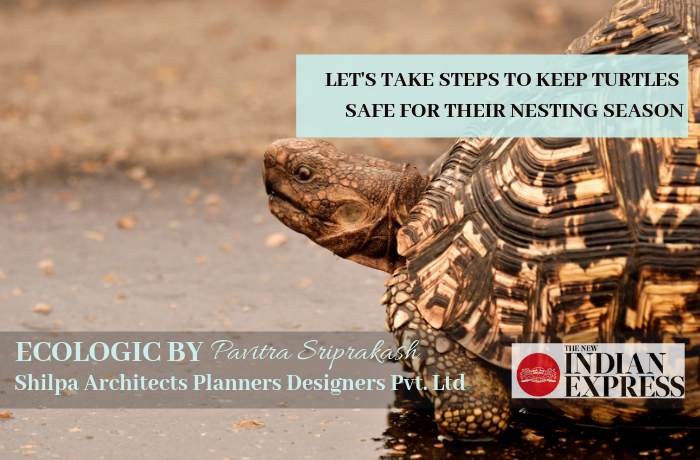 Let us support these creatures for a safe nesting season in every way we can.